Click on title above to view homepage, then use links on right for specific film reviews and articles. Sword of Sherwood Forest (1960) film review. Sword of Sherwood Forest was the second Hammer Robin Hood film after The Men of Sherwood Forest. 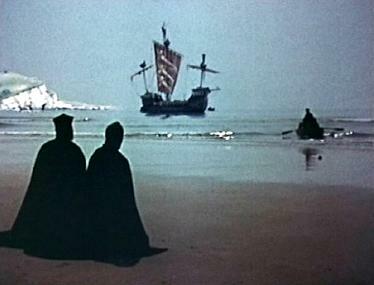 The presence of Richard Greene in the lead role may satisfy many fans but the film is disappointing, long on dialogue, with rather too many tedious tests and demonstrations of Robin Hood's archery skills, and a basically simple plot which nevertheless becomes totally confusing due to its direction. By this time in 1960 Richard Greene was of course the established image of Robin Hood in the public eye, and competently delivers here a slightly more aggressive Robin than in his television series. A blonde Maid Marian (Sarah Branch) was no doubt cast more for her chest size than her acting ability, (this being a Hammer film), whilst Little John (Nigel Green), is merely tall and Friar Tuck (Niall MacGinnis) is cantankerous but totally lacking any wit or humour. Director Terence Fisher, who normally excels in the Hammer Horror genre, fails here to ignite any action and the final swordfight, which lapses into a series of oddly still and staged poses, becomes ridiculous. On the positive side Peter Cushing as the Sheriff of Nottingham is wonderful. Cushing plays the Sheriff as a military man, in many ways anticipating the Robert Shaw interpretation in Robin and Marian by almost two decades. Peter Cushing's Sheriff also, like Shaw's, has an underlying sense of honour which leads to his downfall. Another stand out performance is that of Oliver Reed in a cameo role as Lord Melton. Reed's psychopathic villain makes one wish he had been given a prominent Guy of Gisburne type role, but alas this is not the case. Filmed in Ireland the locations, sets and costumes are most pleasing, and fans of 1950’s British music will spot crooner Denis Lotis in the Alan A’ Dale role. But in conclusion, the combination of Hammer, Terence Fisher, and Richard Greene, promises much more than it delivers. (See comments box for more cast details). Robin Hood film reviews at this website, and more pictures of Robin Hood at this website. A Challenge for Robin Hood came at a time when all Hammer films were suffering from a distinct lack of energy and inspiration compared to their earlier works, and this was no exception. The intention seems to be to rewrite the story of Robin Hood almost entirely, having already exploited the popularity of Richard Greene in the earlier Sword of Sherwood Forest. 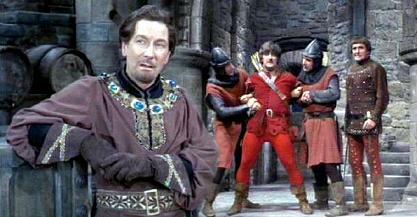 In Challenge for Robin Hood Robin is a Norman landowner, with Will Scarlet and Little John numbering among his men. He is outlawed when falsely accused of murdering his uncle, and flees to Sherwood Forest where he meets Alan A Dale and a band of outlaws. Once he has proved his worth to a sceptical Alan A Dale his intelligence and skill with the long bow quickly make him their elected leader. Robin Hood is played by Barry Ingham and his toupee; the performance is adequate but could never compete with the public's expectations as defined by Richard Greene. Will Scarlet is agreeably aggressive and stocky in appearance, but the concept of acting eludes him as it does Leon Greene in the Little John role. Robin Hood fans will be pleased to see the aging James Hayter return as Friar Tuck once more, but for nostalgic reasons only. The dark, gothic atmosphere normally associated with a Hammer film is missing, Lincoln green costumes are freshly pressed and tailor made, whilst the sight of Robin and Little John singing around the camp fire (“camp” being the operative word) is frankly hilarious. However, there are good points. John Arnatt as the Sheriff of Nottingham deserves credit for his portrayal of the Sheriff as a sly, scheming, manipulator of those around him. Also Alan A Dale, played by Eric Flynn, has a more central role than in any other Robin Hood film, with the possible exception of Walt Disney's The Story of Robin Hood. But this Alan A Dale is an aggressive outlaw, keen to wreak revenge on the Normans. He only becomes the musical Alan A'Dale of legend near the end, and when he does it is a disappointment because it is his aggression which has propelled so much of the film to that point. (See comments box for more cast details). The Men of Sherwood Forest; Robin Hood meets Hammer Horror. The Men of Sherwood Forest (1954), was the first Robin Hood film made by Hammer Productions at Bray Studios, and their first colour film. The meeting of Robin Hood and Hammer was inevitable, Hammer being a specialist in producing low budget films which exploited the success of previously well established themes, mostly with outstanding results. In 1957 their Curse of Frankenstein single handedly relaunched the whole horror genre, a success which would give rise to the phrase Hammer Horror. The Men of Sherwood is not quite in that class, but it is a good film and worthy of much more attention. Filmed in genuine English forests, with real English castles as backdrops, the locations and sets are excellent throughout. The villains in particular hint at the dark cloaked Hammer style of their later horror catalogue, and the story is tight and well delivered, involving King Richard's imminent return to England at a secret location. What is refreshing here is the presentation of a single adventure involving the famous outlaw, and not a retelling of the whole legend with speculation about his origins. The Men of Sherwood's time of release was ill fated, not being as "family oriented" as the slightly earlier Disney version The Story of Robin Hood, and soon to be swept aside by the magnificent Richard Greene series The Adventures of Robin Hood. But it is a film with many good qualities, and well worth revisiting. (Note: The date given for the production of this film varies wildly across the internet. I have given the date as it appears on Hammer's official site. See comments box for more cast details). For more Hammer Horror pictures from The Men of Sherwood click here. 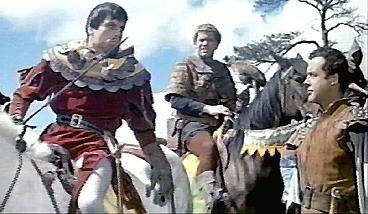 Or simply visit http://robinhoodoutlaw.blogspot.com/ for pictures from Robin Hood films in general, including others from the Hammer studios. Will Scatlock was forced into the outlaw way of life before Robin Hood, although if the stories are true that Will was Robin's cousin, they could have been outlawed at the same time simply because they were related. Will's early life as an outlaw was dominated by his anger and rage at the Normans. Will Scatlock lacked Robin Hood's later noble principles about robbing the rich to feed the poor; he simply wanted revenge. It was precisely this angry, hot headed state of mind which prevented him from becoming an effective leader, although his aggressive tone was certainly an influence among the outlaw fraternity which surrounded him. Some say the name "Scarlet" was bestowed on him because of this anger inside, (a concept explored most successfully in Robin of Sherwood. It is also possible the name Will Scarlet was given him by the other outlaws because of his amusing habit of incorporating some of the rich fabrics and items of clothing he stole into his own shabby attire, much like wearing trophies. But one thing is certain; the real Will Scarlet was no foppish dandy. After Robin Hood's natural leadership skills had organised the outlaws of Sherwood Forest into an effective force to combat the Sheriff's exploitation of the people of Nottingham, Will Scarlet would become one of Robin's most faithful and devoted followers, second only to Little John. Possibly born in Mansfield, Nottinghamshire, the church of St Mary in Blidworth is said to be his final resting place. Top: Will Scatlock (Bruce Seton) is mortally wounded in battle. His final wish is for Robin to take over as leader of the outlaws. (Scene from The Adventures of Robin Hood television series). Bottom: Will Scarlet as played by Patric Knowles was a rather ridiculous looking character in The Adventures of Robin Hood (1938), a trend continued by Ronald Howard for 1950's television, and Anthony Forwood in the first Disney version of the legend. Ray Winstone totally restored the character's credibility in Robin of Sherwood a stunning performance in which his torment and anger emanated from the small screen. Robin Prince of Thieves would seem take a lot of it's inspiration from ideas within Robin of Sherwood, and Christian Slater certainly continued the trend of a tormented Will Scarlet. But before them came the gritty Robin and Marian which explored the final days of Robin Hood, days in which Robin was to find only an equally aging Will Scarlet, played by Denholm Elliott, and Friar Tuck still living in Sherwood Forest. Although Errol Flynn would have you believe otherwise, there is no doubt the Sheriff of Nottingham and not Guy of Gisborne was Robin Hood's true arch enemy, a cold hearted scheming opportunist, cunning and clever in equal measure. Nottingham actually didn't get its own Sheriff until the mid 15th century. At the very start of the 13th century the title would have been "High Sheriff of Nottinghamshire, Derbyshire and the Royal Forests". Sometimes the title was appointed by the King, sometimes purchased. Such a person would have essentially been a debt collector. Not being paid a wage, he took a percentage of the debts he collected as his fee. Over time, the Sheriffs became responsible for escorting prisoners to court, collecting taxes and rents, and keeping the peace. Such an office, certainly open to abuse, became redundant as the centuries passed. But Nottingham still has a Sheriff for tourism and promotional purposes, thanks to the city links with Robin Hood. The first female Sheriff of Nottingham was Mrs. C. M. Harper, who had previously worked on the Nottingham Council. She held office for the year 1931/32. In Robin Hood's day the title of "Sheriff" did not yet strictly exist, but the man in charge of collecting taxes and enforcing the law, would always be called such in the early ballads. Ralph Murdac (Murdach) is probably the most popular contender for being the actual Sheriff who Robin Hood most encountered, as it was he who defended Nottingham Castle against Richard 1st. But the legends tell of Robin's encounters with more than one Sheriff, suggesting this official position changed hands several times whilst Robin roamed Sherwood Forest. Another Knight who is often suggested as Robin Hood's Sheriff of Nottingham is Simon de Headon, and you can see his Tomb Slab on THIS LINK. For much more information and pictures of the Sheriff of Nottingham visit the links on THIS PAGE. 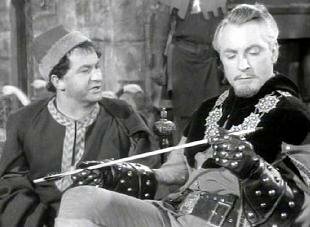 Above: Without doubt the most famous Sheriff of Nottingham is Alan Wheatley in the 1950's television series The Adventures of Robin Hood. Cunning, camp, and cool, in equal measure, this Sheriff's wit is the equal of Robin but he is ultimately let down time and again by the inadequacy of his soldiers. Robin Hood links to every page in this blog! Robin Hood and his bow, the Longbow. Robin Hood and his bow, pictures. Sherwood Forest, Thoresby Park, the Dukeries. ROBIN HOOD is the most famous outlaw, and the most skilful archer the world has known; a natural leader of men in his fight to defend the oppressed people of England. Some say his strength came from a Pagan faith in the energies and spirits of the forest. Some say it came from a loyalty to the absent King Richard. One thing is certain. He will continue to inspire generations to come, just as he has for centuries past. ABOVE: Robin Hood picture gallery. Top to bottom: Errol Flynn, Richard Todd, Richard Greene, Sean Connery, Martin Potter, Patrick Troughton, Matthew Porretta, David Warbeck, Michael Praed, Jason Connery, Jason Armstrong, Kevin Costner. BELOW: Don Taylor, Robin Dunne, Patrick Bergin, John Bradley, Douglas Fairbanks. LITTLE JOHN stood over seven feet tall, a gentle giant of a man. He was skilled with the sword and long bow, but favoured the long staff as his weapon of choice, at which no man could best him. He remained Robin Hood's loyal servant until the end, even burying his master where his final arrow fell. ABOVE: Top to bottom: Archie Duncan, Clive Mantle, Nicol Williamson, Nick Brimble, David Morrissey, Gordon Kennedy, Dan Meaden. BELOW: James Robertson Justice, and Mark Gibbon. WILL SCARLET was a violent, tormented soul. It seems only his respect for Robin Hood kept him in line, although arguments were many. Will beat Robin in their first swordfight, but his temperament prevented him from being the leader the outlaws needed. Some films and TV shows depict him as a Scarlet Pimpernel type, a Dandy. Nothing could be further from the truth. ABOVE: Top to bottom: Bud Geary, Harry Lloyd, David Butler. BELOW: Anthony Forwood, Paul Eddington, Owen Teale, and Richard de Klerk. MAID MARIAN was the original English rose. Her beauty brought many male admirers, including the Sheriff of Nottingham and Guy of Gisborne, but her heart belonged to Robin Hood. Her greatest skill was as a spy, and many times she risked her life taking information from Nottingham Castle back into Sherwood Forest. Marian was also a very capable archer, and equally skilled with the sword. ABOVE: Top to bottom: Olivia de Havilland, Joan Rice, Patricia Driscoll, Diane Keen, Judi Trott, Uma Thurman, Anna Galvin, Ciaran Madden, Enid Bennett, Lucy Griffiths, Mary Elizabeth Mastrantonio, Cate Blanchett. BELOW: Bernadette O'Farrell, Anna Galvin, Kathleen Byron, and Erica Durance. FRIAR TUCK's large appearance belies the excellent swordsman within. On occasion he even bested Robin Hood in playful fight. Friar Tuck loved his food and wine, but he was a spiritual man, an ideal counsellor for the outlaws' personal problems, and probably versed in basic medical techniques with which to attend their wounds. ABOVE: Top to bottom: Alexander Gauge, Niall MacGinnis, Phil Rose, David Harewood, Michael McShane. BELOW: James Hayter (2 pictures from 2 different movies), Bill Dow, Kenneth Gilbert. The SHERIFF of NOTTINGHAM is the most famous of Robin's enemies. An evil scheming man of supreme intelligence, he cared little for either Saxon or Norman point of view as long as he stood to benefit from the chaotic situation the King's absence created. Although Robin regularly defeated the Sheriff he can rarely say he outwitted him. ABOVE: Top to bottom: Alan Wheatley, John Arnatt, Paul Darrow, Alan Rickman, Keith Allen, Lara Pulver. BELOW: Robert Shaw, Peter Cushing, Julian Sands, Nickolas Grace. GUY OF GISBORNE was originally an assassin dressed in animal skins, and only appears briefly in the early tales. But in the 1930's, Hollywood made his name legend. Robert Addie played the part in the 1980's "Robin of Sherwood", and many fans think this the definitive interpretation. But admirers of Richard Armitage (center) and Michael Wincott (bottom), will disagree. ALAN A DALE was an invaluable member of Robin Hood's Outlaws. An excellent woodsman, but his real contribution was in raising the men's spirits around the camp fire with his ability to translate the events of the day into a humorous lyric. ABOVE: Top to bottom: Elton Hayes, Richard Coleman, John Schlesinger, Lloyd Talman, Joe Armstrong. MUCH the Miller's Son, rescued by Robin Hood after being caught poaching the King's deer, then to join Robin's outlaws as a symbol of the oppressed common man whom Robin Hood fights to defend. ABOVE: Peter Llewellyn Williams, Danny Webb, Sam Troughton, Joe Cook. The best interpretations of the Robin Hood legend acknowledge the superstitions and beliefs of his day. Geraldine MacEwan (above top) made an unforgetable witch Mortianna in "Robin Prince of Thieves". Anthony Valentine (above middle) also excelled as Sorcerer Baron De Belleme in "Robin of Sherwood". In 2008 Josie Lawrence played Matilda in the BBC's Robin Hood Series 2, a "witch" credited with raising Robin Hood as a boy. NASIR in Robin of Sherwood (above top), introduced the concept of having a Muslim outlaw in Robin Hood's Men in. This hugely successful inovation continued with KEMAL (New Adventures of Robin Hood), DJAQ (Robin Hood 2006), and AZEEM (Robin Hood Prince of Thieves). KING RICHARD in "Robin Prince of Thieves" (above top), was played by Sean Connery, the same actor who played Robin himself in "Robin and Marian". Walt Disney's "Story of Robin Hood" cast Patrick Barr in the role. Michael-John Jackson appeared in "The Legend of Robin Hood", Wallace Beery was King in the Douglas fairbanks silent 1922 version. BELOW: Ian Hunter (The Adventures of Robin Hood), Steven Waddington (BBCs Robin Hood, 2008), and John Rhys-Davies (Robin of Sherwood). PRINCE JOHN plots how to take over the throne during King Richard's long absences from England. Above: David Dixon "(The Legend of Robin Hood"), Sam De Grasse (silent movie 1922), and Toby Stephens (BBCs Robin Hood Series 3). BELOW: Hubert Gregg (Story of Robin Hood), David Richmond-Peck (Beyond Sherwood Forest), and Phil Davis (Robin of Sherwood). The NIGHTWATCHMAN. The BBC Robin Hood series 1 & 2, gave Maid Marian (Lucy Griffiths) a secret identity. The most revolutionary addition to the legend since Nasir in the 1980s. DERWENT (Victor Woolf) was fairly typical of the semi-anonymous outlaws who surrounded Richard Green in TV's Adventures of Robin Hood. Suffice to say that, when 1950's kids played Robin Hood, no-one wanted to be Derwent! Robin Hood and his Merry Men. Robin Hood Festival, Edwinstowe, 2014. Robin Hood and the Sheriff of Nottingham. Robin Hood Ghosts of Sherwood (2012). Will the Bowman, the forgotten outlaw. Robin Hood (1906) the stage play. Robin Hood: What bow did he use?